The system is now up and running. It is capable of communicating with the GPS receiver to get it into a known protocol (NMEA) and baud rate from an arbitrary starting configuration. I had to determine the pinout for the receiver as it was a USB GPS receiver. A check with the multimeter quickly identified the pinout of the four wires, TX was easy to spot as it was a constantly changing voltage whereas RX only changed when a command was sent. Once the prototyping is finished the USB receiver will be restored to its former glory. A few challenges were involved in figuring out the receivers startup configuration. It looks like at reset it outputs NMEA at 4800 baud but expects to receive NMEA configuration commands at 9600. This ‘interesting’ configuration was overcome by sending NMEA and SiRF configuration commands to the receiver at all supported baud rates. Damn its good when things just work the first time. So far everything has been tested at 5v. I’m going to have to check that it operates at 3.3v to easily interface with the SDCard. On a side note, the BusPirate is excellent for development and debugging work. So far I use it to program FPGAs, debug serial strings (as above), peek at JTAG on wireless routers and frequency measurement and generation. It’s the best $30 I spent. The initialisation code initially started out trying to determine the baud rate the device was operating on and then send it the appropriate configuration commands. Testing this method on a PC resulted in alot of confusion until I figured out what was happening. Afterwards the rest of the configuration became relatively easy. //in either NMEA or SiRF mode and by default xmits NMEA at 4800 and listens and 9600. //easy way of initilization: step through each baud rate sending the NMEA then SiRF init strings. //by the time we get to the desired baud rate we should be good. //the GPS module should now be operating in NMEA mode at 38400 baud. The code above sucessfully configures the GPS, as shown in the photo. I guess this is just another case of brute force winning over elegant design. 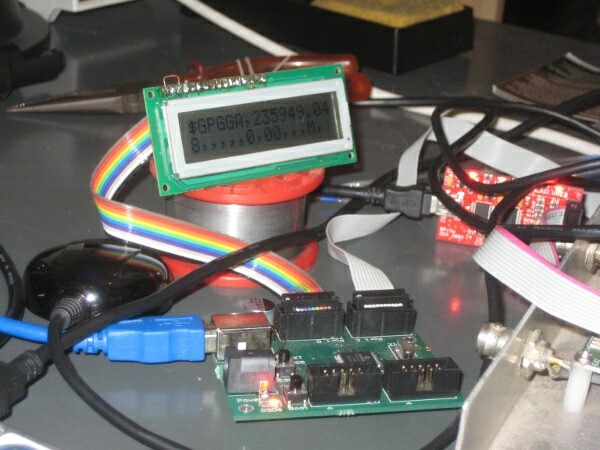 The code for the system initilisation and serial communication is in gpslogger-0.01a.zip. This entry was posted on February 10, 2010, 11:05 am and is filed under Make. You can follow any responses to this entry through RSS 2.0. You can leave a response, or trackback from your own site.